Our client Pete came to use with the requirement for a walk-on structural glass floor panel for use as a display cabinet for a wine cellar. 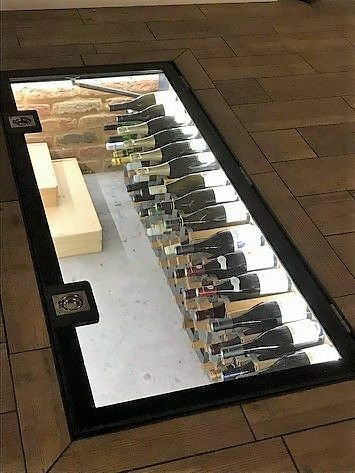 The frame needed to hinge open to allow access down into the recess where the wine bottles were stored and there is only one way to achieve that safely, with a mechanically assisted opening system. Our gas-strut hinged frame system will support significant weights of glass, over 100kg, and still open with little effort and close slowly and safely. The hinged glass unit was installed into a new wooden floor and provided a stunning feature to the kitchen area. Pete displayed multiple bottles of wine within the recess and backlit the area with LED lighting to provide a truly fantastic room feature, wow-factor and talking point for any guests. Creating such an area is quite simple for many homes that have cellars or raised wooden floors. All our hinged glass floor systems are made to order and bespoke to individual customer requirements allowing our customers maximum flexibility in design.